PARTY LIKE IT'S 2017!! with RULA & CATHERINE: GIVEAWAYS, POPPERS & GOOD FUN! Hey y'all! This is what I call my good, good friends when they come to my house for one of my parties (This is left over from my 30 years in Texas. I can’t NOT use it!). Rula and I are inviting you to our New Year’s Giveaway Festivities! You have all been so very special to us over the years and now that we’re starting a brand new year, we want to thank you for being loyal to us. We’ve had a blast and a half writing blogs for you all to read, comment and participate in conversations. So, now, it’s our turn to shower all y’all with gifts that will bring you (the lucky winner) lots and lots of fun reading, quite obviously since this is an author network, after all...and some treats and trinkets. You've earned it! Nothing is worse than January when you’re overwhelmed with taking down decorations and paying off Christmas. The kids are having a great time with their toys, but what do you get? More work cleaning up and a budget that was blown on Christmas dinner and New Year’s Day brunch. WE SO GET IT. You deserve some pampering time all to yourself! So we've put together a huge giveaway to help one lucky winner kick of the New Year with a relaxed smile on their face. A pair of super soft spa socks, infused with aloe and coconut oil. Perfect for pampering your feet while you curl up with a romance novel. A box of Tazo's 'Zen' tea. Even their beautifully written message on the back of the box soothes your senses and I love how it ends appropriately with "Each cup is a story, unfolding with every sip." Perfect for sipping while reading a book! A bag of organic Vermont Coffee Company coffee beans...great for a rich cup of coffee after staying up all night because that romance novel was too good to put down. 2 bars of Endangered Species dark chocolate (hazelnut toffee and espresso beans). I love these chocolates...especially since 10% of net profits are donated to non-profit conservation programs that protect and preserve wildlife. Are you getting the feeling already that we’re trying to overwhelm you? OH, WOW!! You’re so right! You’re our readers and you deserve it. Autographed copies of SHORES OF INDIAN LAKE SERIES” #1 LOVE SHADOWS; #3 A FINE YEAR FOR LOVE; #6 FEAR OF FALLING #7 SOPHIE’S PATH. Box of super scrumptious Spiced Pecan Toffee with Ceylon Cinnamon. Assorted New Year’s Eve crowns and silver poppers right off Catherine’s table. One winner will receive both gift sets (mailed separately by Rula and Catherine)...worth over $100 total in goodies! Now that’s gotta make you feel just a bit giddy. Maybe not as good as glass of fabulous French champagne in a really elegant Venetian crystal flute, but gee whiz, we sure are trying to tickle your fancy. You have been loyal to us and we are deeply grateful. More than that, you are the reason we work so hard to give you a story that will haunt and intrigue; bring you to tears and laughter and always, always, renew your hope in the one thing that is the reason to be on this earth---LOVE. We also seriously appreciate signing up for both of our Newsletters (if you haven't already: Catherine's / Rula's), sharing our posts on Facebook and Twitter and commenting here on the blog. TO ENTER THE GIVEAWAY: (Note - US only for the above gift packs. If by chance an international winner is chosen, they'll receive gifted Amazon Kindle copies of the books listed above. Then another name will be drawn for a US winner. Sorry, but this is due to package size/weight). See entry form for details. Giveaway open 1/3/17 12:00AM PST and closes 1/5/17 12:00AM PST. Be sure to check back here (this post) in the comments section on Thursday, Jan 5th for the winner announcement. The winner will also be notified by email. Thanks, Kate! Happy New Year to you! Thanks for stopping by in the middle of the night! What gives? See that everybody, authors work 24 hours round the clock to bring you great stories. LOL! Ha, ha! It's morning for me...but what about you, Catherine?! Wow! These stashes are guaranteed to chase away any after holiday blues. Congratulations on your upcoming releases! Winter blahs are here with a vengeance! It was so dark yesterday it was like working all night! Now we have pea soup fog. Congratulations, Diana! What a great year you're going to have! Best wishes to your daughter! I saw your announcement on FB! So exciting for you all! We love hearing about romance and weddings here on the bog :). Congratulations!!! Wow, super giveaway. How fun. Don't you love starting the new year like this? Thanks. Thanks! We're having tons of fun with it! We were feeling energized just putting it all together! I'm all for anything that has to do with parties! Thanks for bringing readers great stories, ladies! I love when the Heartwarming line takes readers on wonderful, exotic locations. Write on! Thank you for reading them!! So glad you love all the settings/locations and virtual travel Heartwarming books have to offer! I'm with you, Audrey...another reason I adore Rula's stories! Ladies, your books are truly gifts enough. I've loved each and every one. But you do know how to kick off a new year. Aw, thanks and ditto about your books! Happy New Year, Roz! Thanks, Roz! We're hoping for a fabulous 2017! Thanks, Liz! We try :)! So, we get an "E" for Effort, right? You're so welcome! Happy New Year! You are most welcome, Erin and good luck! Wow! What a way to kick off the start of a great new year! Thank you for the opportunity, ladies! Hi, Melanie! We're having a blast with all this! Happy New Year! Thank you for the awesome chance! You're welcome and best of luck in the drawing! Happy New Year! Thanks for the FAB giveaway! Happy New Year to you too! Good luck! Just chiming in to add my New Year wishes! You two are such an inspiration to be sunny and generous! Those are my words for the year! Happy day, Everyone! Thanks, Muriel! You exemplify sunny and generous! Happy New Year! Muriel, I'm saying ditto to Rula here! YOU are the sunny one and more than gracious always. So glad you like it! Good luck! Isn't this great? I feel like it's a treasure hunt! It makes me smile to think of someone opening up these boxes of happy endings. Great giveaway. Aw, we're all about spreading the smiles! And we love happy endings!! In our way, it's like being Santa Claus, but in January. What an awesome way to start a new year. These both look wonderful and I would love to see them show up at my door. Happy New Year to you Rula Sinara & to you Catherine Lanigan. May you fill the bookshelves with many new books this year. Thanks so much, Cheri! Happy New Year and may yours be filled with wonderful reads! Happy New Year, Darlene! Best of luck in the drawing! Good luck, Darlene! And thanks for participating! Happy New Year's, what a cool give away, diverse and engaging. Happy New Year, Pam! Giving is so much fun and so energizing! Thanks, Pam! We had a blast putting it together! A big thank you to everyone for joining in the fun! I have to ask...what's your favorite item in each giveaway bundle? Anything catch your eye? I personally can't decide lol! Awesome giveaway. What a great way to start 2017! Hey, Tara! Happy New Year! The books are amazingly desirable and then you added all my favorites including Zen tea! Wow, great treats for everyone! LOL, I'm writing too! I've been alternating coffee and Zen tea...keeps me level lol. Thanks, Lori! We're glad you like it! Thanks, Lori! Good luck in the drawing! Count me in! Happy New Year!! Fabulous, Renee. Happy New Year and good luck! Thanks for entering! Good luck and Happy New Year! Happy New Year, Connie! Best of luck! I would be thrilled to win this generous New Year's giveaway! All the best this year to both of you! HI, Linda! Good luck to you! Our best to you too, Linda! Happy New Year! This is a great huge giveaway, I'd love to win! Who wouldn't want to win all these great prizes, I couldn't tell which one I love best because I want them all. Thank you for thinking about us. Happy New Year! Donna! Happy New Year. Yeah, Rula and I thought we should just really go for it, you know? Lots and lots of goodies! Thanks so much for the great compliment, Donna! We had a lot of fun putting this giveaway together :). wow! Y'all are getting 2017 started off with a bang! what a fantastic prize pack. Thank you for the chance. What a terrific way to start 2017! So much awesomeness! Thanks for this generous giveaway. It's always gloomy these first weeks of January and we wanted to get this new year off to a crazy, fun and happy start! I think this will do it, right? Always great to start a new year on a positive note :)! Glad you like the prize packs! Hey, Awesome Amy! Thanks for stopping by to see us. Thank you ladies for this generous giveaway. Thank you for coming to our party, Marion!!! You're welcome, Marion, and thanks for entering! I love the crackers. They make me feel like it's a real celebration! Not to mention all of Rula's books...a treasure each one! And Catherine's books are the true treasures!! You are so welcome, Rhonda! Good luck! Thank YOU, Heather! Good luck! Hi, Teresa! How are you? Happy New Year! Thanks, Teresa! Glad you like them! Hi, Angela! Happy New Year! Thanks for stopping by! You're so welcome, Angela! Happy New Year! Hi, Margaret! Happy New Year to you as well! Happy New Year and good luck in the drawing! Wow, you really went all out with this giveaway! Found a new author and maybe a chance to win a bunch of prizes! Looks like Santa Claus stopped by, huh? Thanks for entering and partying with us! Best of luck in the drawing! Awesome giveaway and way to cuddle up on the couch with some new books, my blanket and cozy socks! Add some hot chocolate and it's a great day! The sock are amazing. It's snowing here and I've got a pair on myself as I sit at the computer. That sounds like the perfect plan! January is all about getting cozy and I love soft cozy socks to keep me warm! Great prize pack. Thanks for the giveaway. Happy New Year. Thanks, Teresa, and Happy New year to you too! We're trying to do our part to get 2017 off to a great start :)! Thanks for having fun with us and good luck in the drawing! Oh wow, what an amazing giveaway! I love romance...and these are both new authors for me! I have to add to my TBR list! Laura! We are thrilled to be introduced to you! Thanks for commenting and Happy New Year! Thanks so much for adding us to your TBR pile, Laura!! Best of luck in the drawing and have a super 2017! Wow! What an awesome prize pack! Every single prize in it would be welcome at my house...and especially the A HEARTWARMING CHRISTMAS CRAFT AND COOKBOOK! Hi Annmarie! I'm glad you like the prizes! A Heartwarming Christmas Craft and Cookbook is really great to have. 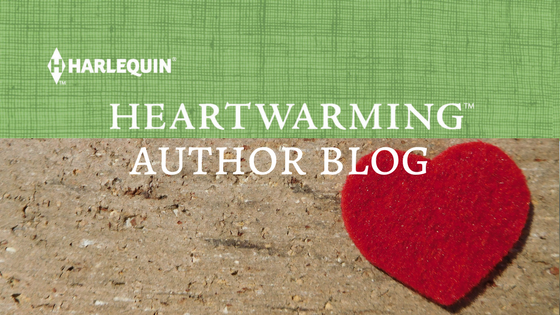 It was put together by the same 12 Harlequin Heartwarming authors who wrote the bestselling anthology last year, A Heartwarming Christmas (I was one of the authors and was honored to have my name alongside such amazing writers). And a related new anthology came out this year...A Heartwarming Holiday. A lot of cozy stories! I would love the infused socks and the coffee would be great for my husband. Hi, Darlene! Good luck with the contest! Aw, you're sweet for sharing with him if you win! :) Good luck in the drawing! Happy 2017, ladies! What a fantastic giveaway to start off the new year! Hi, Britney! Thanks for joining in on our fun!! Love it all, so generous! Glad you like! Best of luck! This is great. These books look like a nice read. I hope you enjoy them all!! Okay...back to writing another for my Shores of Indian Lake series!! Wahoo! I hope you enjoy them, too! You can't go wrong picking up one of Catherine's books! Like Catherine, I'm busy writing today as well :)...working on the fourth book in my From Kenya, With Love series! I love good romances novels. Well, I think I speak for all of the Harlequin Heartwarming authors here when I say that you have excellent taste in genres :)! We love romance novels too! You're welcome! Good luck in the drawing and thanks for celebrating the New Year with us! Is this a fun 2017 New Year's Giveaway Party or what?!! Thank you all for popping in and joining the fun. I can't wait to see who the winner turns out to be! But there's still time for more entries :)...it doesn't close until midnight PST (3AM for EST). Good luck to all!! Awesome prize. Thanks for the chance! You're welcome, Saundra! Good luck in the drawing! What a wonderful array of items and books. even my 11 year old is excited for the fuzzy socks and the popcorn..I guess I could share with her lol. the toffee sounds amazing to me. I could use some new books for the cold winter to come...especially when snowed in. Aw, I love the idea that you and your daughter could have some relaxing 'girl time' together! Doesn't that toffee sound delicious? And there's nothing better than good books to curl up with when it's snowing outside! Best of luck in the drawing and, whether you win or not, I hope you have a beautiful winter! 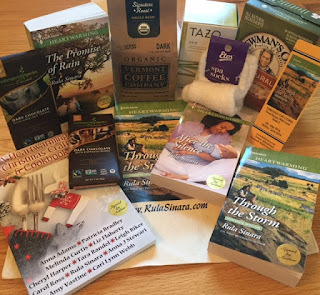 So many good books and wonderful other goodies in this prize pack, I love them all! Glad you like them, June! Good luck in the drawing! Oh my the winner of this give away will have a very happy new year. This prize has everything a book lover would want!! Thanks, Danielle! We aim to please! This is a great prize pack for the New Year! All of my favorite things. Thank you! Thanks for entering! Happy New Year! What a bounty of cools books and stuff to win! Happy New Year and best of luck in the drawing! Thank you so much for the generous giveaway! I'd love to read these book. Omg I love the Endangered Species Chocolates! They are vegan, and come in a bunch of flavors for any craving. So excited you included some in the giveaway! Chocolate and books - what more could a girl want? I love them too! The one with cranberry and almond bits is one of my faves :). Now that is what I call a giveaway!! WHAT AN AMAZING GIVEAWAY! TYSM FOR THE CHANCE. What a super prize. It has a great selection. So the contest has ended. Thanks to all of you for entering and for partying with us! The winner is computer generated/drawn and will be contacted by email then posted here soon (today :). Good luck to all who entered and may you all have a wonderful 2017! Super congrats to Melissa Ann Davison for winning our New Year's Giveaway! We hope all the prizes help you get a relaxing and wonderful start to 2017 :). Enjoy! And many, many thanks again to everyone for celebrating the New Year with us. May you all have a wonderful, happy, healthy and peaceful 2017. All of the Harlequin Heartwarming authors love to hang out with readers and friends and we tend to do a lot of giveaways :)...so don't hesitate to stop by here again, check us out on social media or sign up for our newsletters so that you catch the next giveaway or even news on a fabulous book release (4 new books are released every month! ).